Paquet Builder has powerful automation features that let you integrate it into your own build process, automatic distribution cycles, cron tasks... It also comes with a dedicated console compiler for build machines that don't require Windows user login. 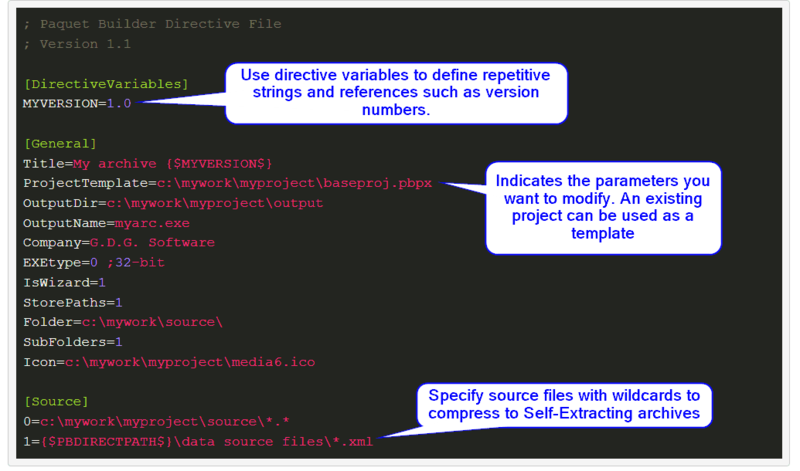 Use the powerful directive feature to create customized Self-Extracting packages with updated source files, modify version information and much more. Paquet Builder introduces a specific file type called “directive file” which is text-based and contains instructions for Paquet Builder in order to create a package. They let you modify an existing project (transform) or create new projects from scratch. Directives can be passed to Paquet Builder through command-line or the App menu. The console compiler also accepts directives. Paquet Builder GUI and console compilers return proper exit codes when run through command-line and in automation process. As you can see, Paquet Builder has a lot of tools designed for automation and batch build. That's why Paquet Builder is used for making hundreds of Self-Extracting packages automatically each day around the world.